An industrial ultrasonic cleaner is usually very large so that it can accommodate large objects for cleaning. Using electric power, an ultrasonic cleaner generates high-frequency pressure waves that agitate the water or cleaning solvent in the machine’s liquid chamber. This agitation creates cavitation bubbles that thoroughly clean the surface of any metal, plastic, or rubber surface. After several minutes, the process is complete and the item can be safely removed from the ultrasonic cleaning machine. Industrial ultrasonic cleaners are manufactured in a wide variety of sizes and can be built with a capacity of over 100 gallons. These machines are usually constructed from steel, with a grated bin that is inserted into the chamber. This bin can be filled with objects and then removed when the cleaning process is complete. Manufacturers of industrial ultrasonic cleaners also create automated control systems that can be integrated with a machine or set of machines to help make a process more efficient. These control systems can be particularly useful in industrial settings where cleaning is one step of a continuous process and the machines are being used almost constantly. Most major manufacturers of industrial ultrasonic cleaners have specialized technicians who are available to provide repairs and technical expertise to their clients. These technicians are also able to help with installation and equipment training. Some manufacturers also offer in-house engineers who will work with large industrial clients to develop a custom ultrasonic cleaning solution that is adapted to the needs of a particular space or industry. Ultrasonic cleaning used to be considered a questionable method for cleaning, and many industry leaders were slow to adopt the technology because they were skeptical. Today, however, ultrasonic cleaning technology can be found at use in pharmaceutical companies, construction firms, weapons maintenance, automotive production lines, and more. Highly recognizable brand name corporations trust industrial ultrasonic cleaners to efficiently and thoroughly clean their components during the manufacturing or repair process. 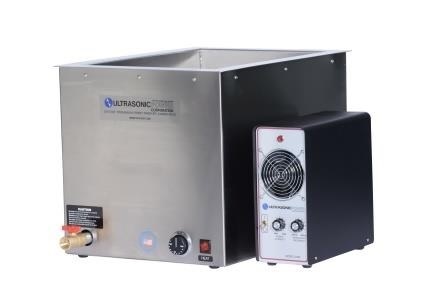 Industrial Ultrasonic Cleaners Industrial ultrasonic cleaners use ultrasonic cleaning technology to clean components, parts, instruments, and equipment in industrial settings.